While the US media fixed its sights once again on Bin Laden’s latest platitudes, a far more critical statement of intent was being delivered in Beirut simultaneously. Druze patriarch Walid Jumblatt — until just last month a firm member of the pro-US March 14 coalition which won a majority in Lebanon’s highly-contested elections in June – on Saturday stirred the murky waters of Lebanese politics by embracing old foes and challenging the regional status quo. In an interview with Iran’s Press TV, Jumblatt said that Lebanon can turn to Iran for the procurement of sophisticated weapons systems to deter its enemies, and that Lebanon has only one enemy, Israel. In an about turn from his years of criticizing Hezbollah, its patron, Iran, and regional ally, Syria, the Druze leader pointed to the benefit of Hezbollah maintaining its controversial weapons arsenal as a deterrent against Israeli designs on Lebanon. The weapons available to the Lebanese Army from the United States and other Arab countries “are not the weapons we need…we need anti-tank weapons and anti-aircraft weapons which I think we can find in Iran or in Russia or in China.” Washington will not provide these weapons because it fears they will inevitably be used against its Israeli ally, added Jumblatt. Jumblatt’s statements to Press TV marks the most recent in a series of disclosures by the maverick politician that has shaken electoral politics in Lebanon. 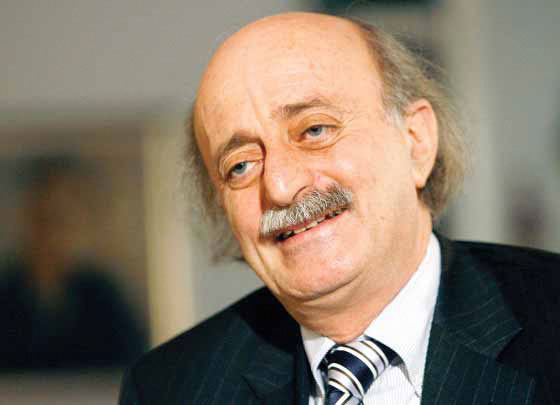 Shortly before voting day, a video of Jumblatt speaking with a small group of loyal Druze sheikhs was leaked to the media, in which he spoke of shifting political realities in the country. Citing the growing fortunes — demographically, financially and politically — of the Shiites, a “dangerous” rise in Sunni fundamentalism, and a decline in power within Lebanon’s once-prominent Christian community, Jumblatt called for a careful rapprochement with the Shia and Syrians. In the secretly taped video, the Druze chieftain also drew attention to the changing status of Shiites internationally: “Britain has launched a dialogue with Hezbollah, and America has launched one with Iran because they both need to confront the danger of the Taliban in Afghanistan and Pakistan,” groups that target Shiite populations as much as they do US forces. Then, on August 2, Jumblatt publically rocked the boat by announcing his departure from the US-backed March 14 coalition, which decisively won the June elections against a Hezbollah-led opposition. To the horror of March 14 and the White House, the former neoconservative darling described his dalliance with the Bush administration as a “black spot” in his political career. What is the significance of all of this? The wily Jumblatt, who is often referred to in Lebanon as the “weathervane” of local and regional politics because of his penchant for switching alliances according to power shifts, is literally today in the position of kingmaker, whatever the outcome of the new Lebanese government. With 11 parliamentary seats under his control, his defection on any issue leaves the current majority with a slim three-seat advantage over the opposition. And that, of course, leaves Lebanon’s strategic role in the Middle East wide open to external influences – whether from the US, Syria, Iran, Saudi Arabia or others. Perhaps the crafty Jumblatt has things just as he would like them, providing his minority Druze community with maximum leverage. In one fell swoop, the Druze patriarch has ensured the attention of major powers and regional players alike. How he plays this out will be interesting to watch.